Chances are, you have rooted your Android device to flash custom firmwares, kernels and other mods. However, doing it can be a little taxing due to the fact that you have to do it through the custom recovery. Thankfully, FlashFire is here to your rescue. You can flash ZIP files, firmwares and even OTA updates from manufacturers, right from the app. Other than flashing, the app even lets you wipe data like system data, 3rd party apps, dalvik cache etc. along with the ability to backup & restore partitions. You must have come across a time when you’ve accidentally deleted important files. Well, we have all been there and it’s pretty frustrating. 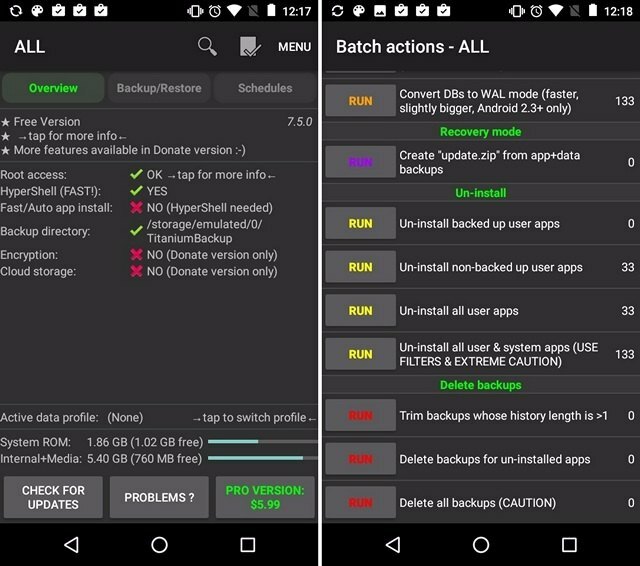 While there are apps that let you recover deleted photos on non-rooted devices, if you are looking to recover all types of deleted files, Undeleter is the app to install for rooted Android devices. The app lets you recover files like images, videos, audios, ebooks, documents and archives. 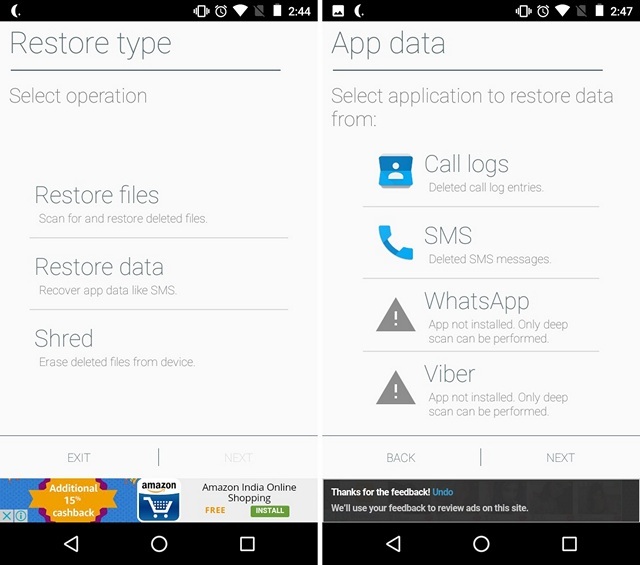 That’s not all, the app even lets you recover data like calls logs, SMS, WhatsApp & Viber messages. Along with various data recovery, Undeleter also brings the ability to shred deleted files, so that they cannot be recovered. 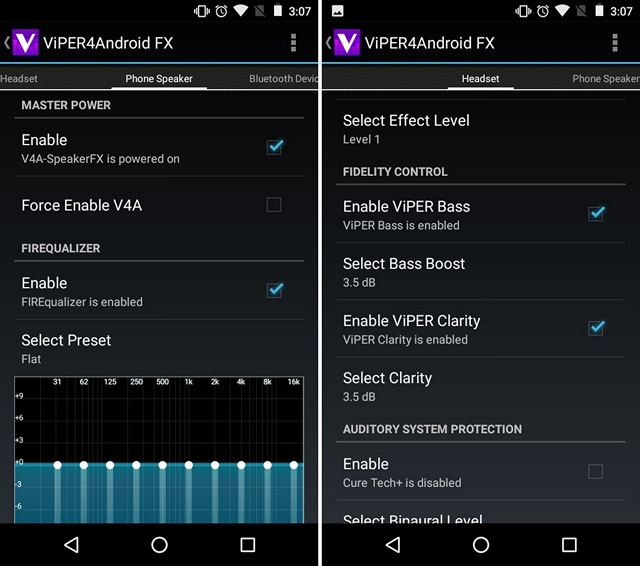 If you are not satisfied with the audio quality on your Android smartphone or tablet, ViPER4Android is the app you should be installing. It’s arguably the best audio enhancer app for Android. The app not only increases the volume of the audio on your device but also improves bass & clarity, thanks to the cool ViPER Clarity and XHiFi technology. The app lets you improve the sound quality that outputs from your phone speaker, headsets, Bluetooth device or a dock. Other features of the app include ViPER’s surround sound options, various audio effects, cure tech+ tech and more. 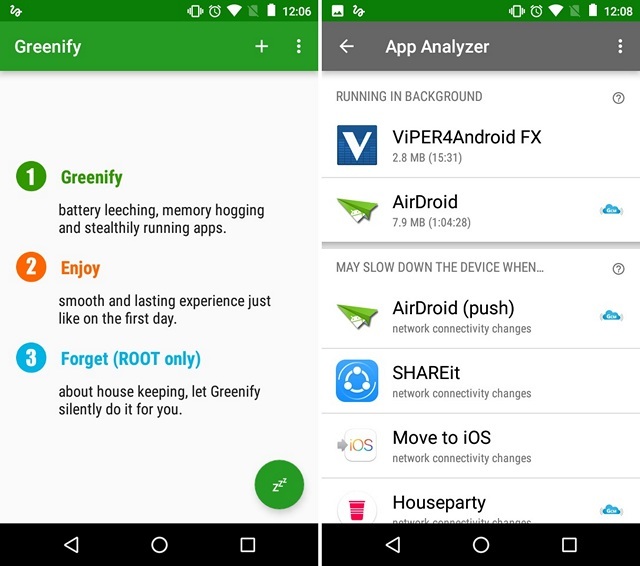 Greenify is the one of the highly popular apps for rooted devices, thanks to its battery optimization features. The app lets you hibernate apps that drain your battery as well as resources, while making sure they offer full functionality when running in the foreground, like iOS apps. The app works similar to the Doze mode, introduced in Android 6.0 but it lets you manually select apps you want to hibernate. While the app can be used on non-rooted devices, it brings “Forget” functionality on rooted devices, which is nothing but Greenify automatically hibernating apps silently. The app does not offer a ton of options but once you start using it, you will feel the difference in your device’s battery and performance. Want to make full use of the multitouch display on your Android device? Well, you should try out GMD GestureControl. 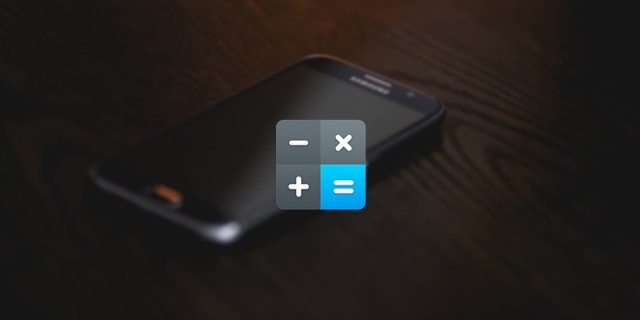 The app brings a number of cool multitouch gestures and it even lets you create your very own custom gestures. For every gesture, you can select various actions like launching an app, shortcut, activity or open a launchpad, which you can totally customize. The app even lets choose an action in a per app basis, plus you can choose when the gesture is active and when it’s not. Overall, it’s arguably the best gesture app on the market, with the amount of control and options it brings. 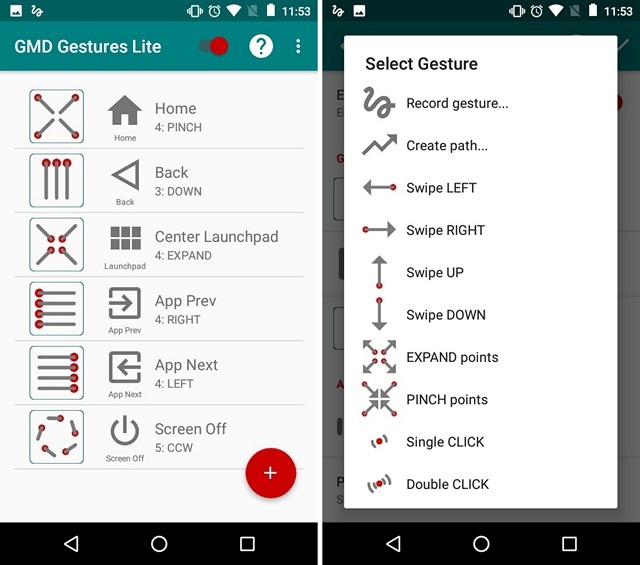 The app is available in a free version but if you want to create your own custom gesture, you will have to get the full version of GMD GestureControl. Chances are, you already know about the famous Titanium Backup app but if you don’t, you are missing out on something amazing. 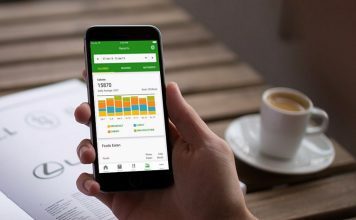 The app is known for its backup abilities, as it lets you backup almost everything on your device, including the system & third party apps and external data but there’s so much more to it. The free version of the app lets you create full backups along with other features like batch background backups, batch apps uninstaller, ability to move apps and their data to SD card, remove orphan data and more. That’s just the tip of the iceberg, as the Pro version of the app brings advanced features like multiple backups, background backup restore, app freezer, encryption, sync backups to cloud storage services, bloatware meter, ability to convert third party app to system app and way more. Overall, Titanium Backup’s popularity is no surprise, considering the plethora of features it offers. If you have just rooted your device, this is an app you must install. 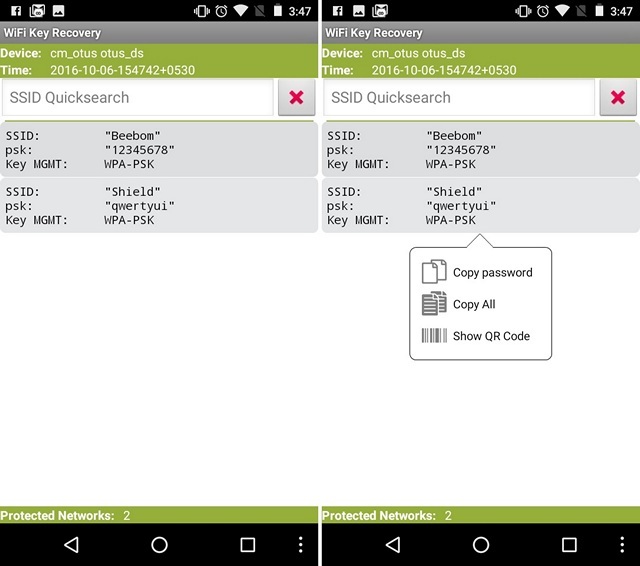 As the name suggests, the WiFi Key Recovery app lets you view saved WiFi passwords. It’s a simple app, which lists down the name & passwords of WiFi networks you have connected to, in the past. This can surely come in handy in cases when you have to share a WiFi network’s password to someone but you don’t remember it. 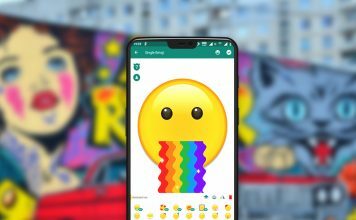 You can just tap on the details to copy them to the clipboard and if you have connected to a lot of WiFi networks, the app features a search feature to let you find the network you are looking for. GravityBox is an app from the Xposed module repository, so before you get to using it, you will have to install Xposed Framework on your rooted Android device and install GravityBox from its various modules. 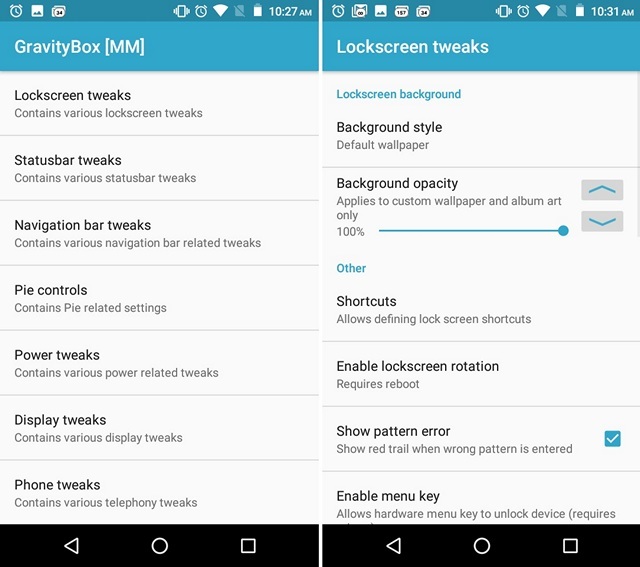 The GravityBox is one of the best customization apps available for Android, as it lets you change almost every aspect and functionality of the Android UI. The app brings a plethora of tweaks for the lockscreen, status bar, navigation bar, power, display, phone, launcher and more. Along with the looks, you can also change the functionality of buttons in the lockscreen, navigation bar, power menu. Moreover, it also includes Pie Controls for people who have always wanted it on their phones. Overall, it’s not possible to tell you about the ton of features that GravityBox offers but it’s highly recommended that you check it out. 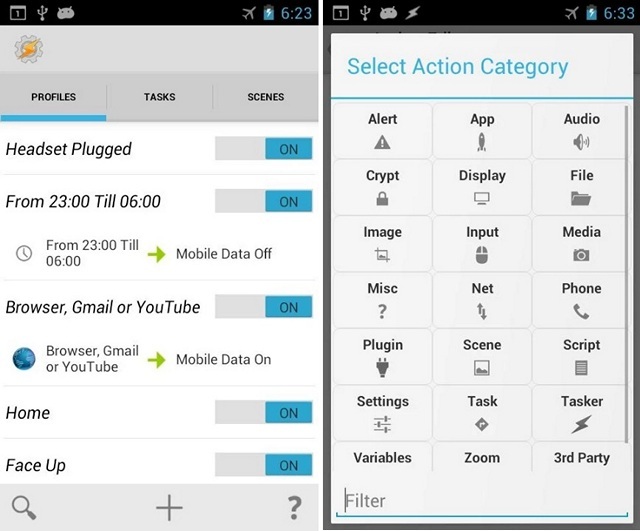 You must be aware of Tasker, the highly popular automation app that lets you automate almost anything. While the app works on non-rooted devices, its advanced capabilities are only available for rooted devices. The app lets you automate tasks in apps, system settings, activities and way more. For instance, you can automatically set the music player to launch when the headphone is plugged in, auto rotate screen for certain apps, dim brightness at specific times etc. You can check out our list of the best Tasker profiles to get started. While there is a steep learning curve, once you get the hang of it, you will love what it can do. On a rooted Android device, you can easily change the boot animation and while you can do it manually, it’s not a process everyone enjoys and this is where the Boot Animations app comes into play. The app brings you hundreds of cool boot animations for devices with different screen resolutions. 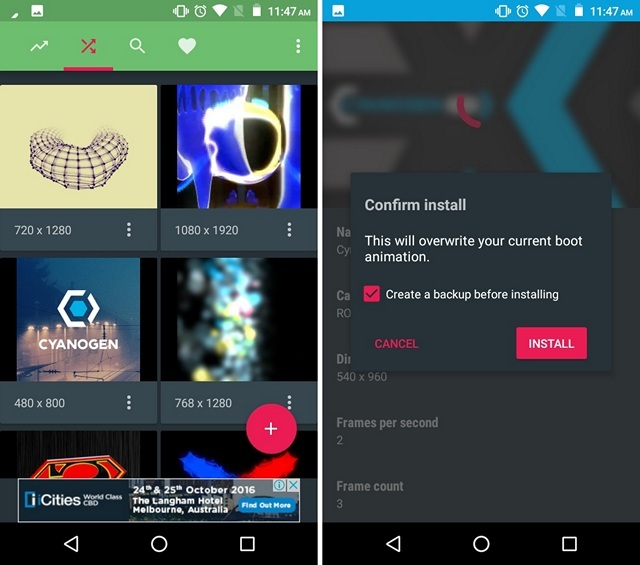 It even lets you create your very own boot animation through a GIF or you can choose a custom boot animation file from your storage. You can also customize the boot animation’s height, width and frame rate. Above all, it makes the installing a boot animation a breeze. Having said that, some devices use different locations when it comes to installing boot animations and you will have to set the directory manually. 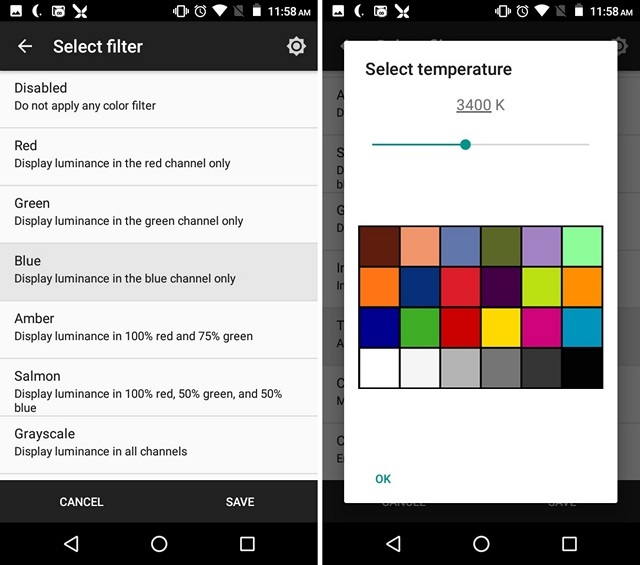 Next app on the list is CF.Lumen, which is an app that lets you add filters to the screen for better viewing at certain times in the day. If you’ve used f.lux, you’ll feel right at home with CF.Lumen. The app lets you set filters for daytime, sundown, sleep and there are a plethora of options you can play with. You can choose from various preset filters like Red, Green, Blue, Grayscale etc. or you can just invert colors, adjust temperature or choose a custom RGB adjustment. There’s also an option to enhance the display for colorblind users. 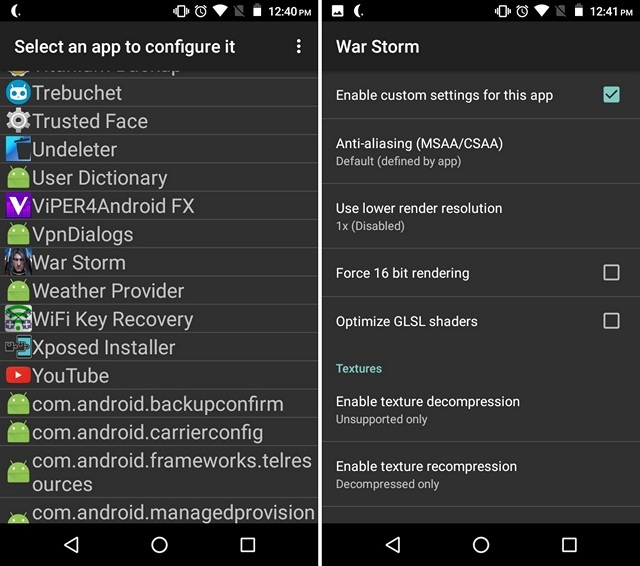 The aforementioned features are available in the free version and you can get the Pro version to get features like Tasker integration, notification options, option to start at device boot and more. This app is for the geeks out there who love to tweak under the hood options to gain better performance, battery life or just for the heck of it. The Device Control app for rooted Android devices might seem like a simple offering on the outset but it’s so much more when you dig deep. The app brings you detailed information around the hardware and software of your device, including info on CPU, GPU, Sensors, performance etc. 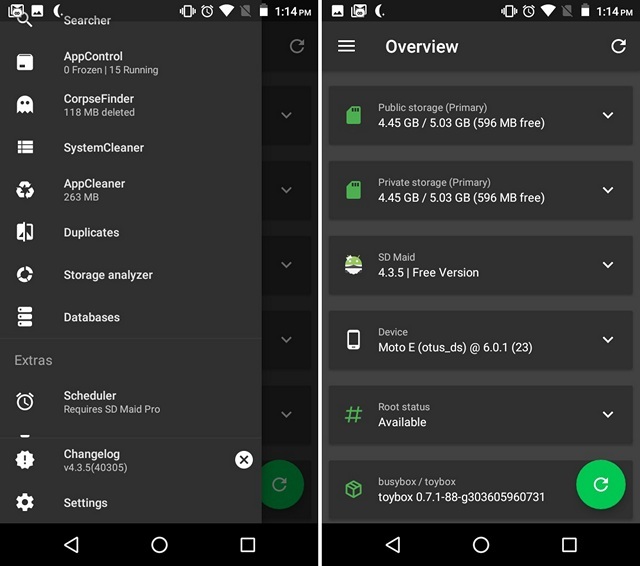 Along with these details, the app packs in tools like app manager, where you can uninstall any third party or system app and you can check the various permissions the apps are taking. Then, there are tools like flasher, bootup restoratiom, build.prop editor, thermal driver and wireless file manager. 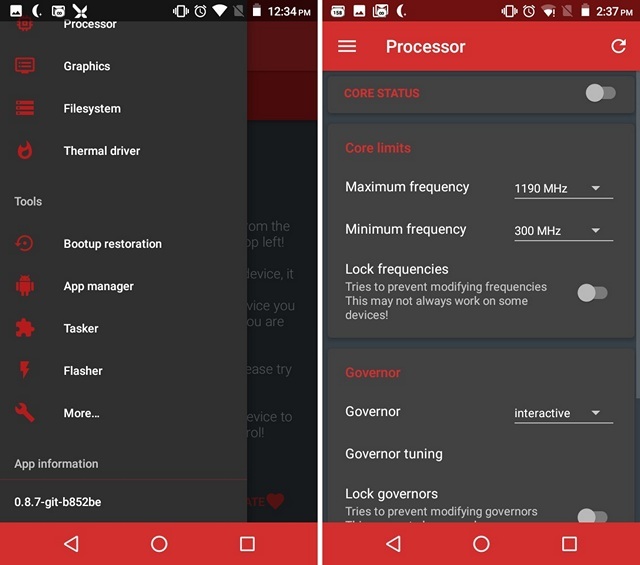 The app also lets you adjust the vibration strength, voltage control, overclock CPU and more. The Device Control is a great all-in-one app with a beautiful and streamlined interface, unlike most root apps, so it’s highly recommended. If you own a rather modestly powered smartphone, which obviously stutters a lot when you try and play graphics intensive games, you should definitely try out GLTools. It’s a gfx optimizer app, which brings a custom OpenGLES driver (proxy) and offers you a number of controls to improve gaming performance. You can change the resolution, rendering bitness for any app or game. 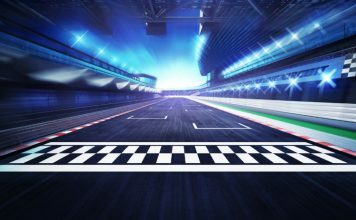 You can even fool the game to believe that your device features a different GPU to enhances graphics even on a low-end chipset. Other features of the app includes texture control, MSAA or CSAA to improve graphics, FPS counter and more. After you have used GLTools, games like Modern Combat 5 should work like a charm on almost any Android device. There are times when you want to boot an ISO image on your PC or Linux system but you can’t seem to find your flash drive. Chances are, you must have wondered if you could use your Android smartphone as a bootable flash drive, right? Well, the DriveDroid app lets you do exactly that! 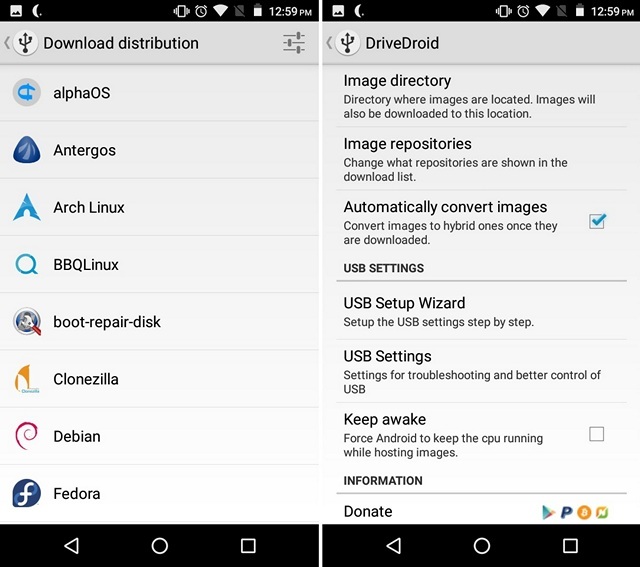 The app lets you boot your PC from an ISO or IMG file stored on your Android device. Along with that, the app even lets you download USB images of around 35 Linux distributions inside the app. The app works well if you just want to boot a Linux distro but the process is a little complicated when it comes to Windows. While the app is free, you can also get the Pro version which removes ads, lets you resize images and add your very own download repositories. Low storage is something every Android owner faces, considering there are a ton of apps to download, plus the devices now shoot 4K videos. Well, SD Maid is arguably the best app to manage the internal storage of an Android device. The app works on non-rooted devices but it brings some advanced capabilities for rooted devices. 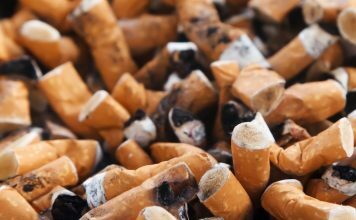 The app removes superfluous files with its SystemCleaner option and files belonging to uninstalled apps on your device with the CorpseFinder feature. It even detects duplicate files and lets you uninstall multiple apps at once. The good news is, the aforementioned features are available in the free version but if you want features like AppCleaner, Scheduler, Statistics etc., you will have to get the Pro version. You must have noticed that most of the root apps that we’ve mentioned above bring capabilities that non-rooted users can only dream of. So, if you have rooted your Android device, you have unlocked the world of some amazing apps and mods. There are a plethora of root apps but the aforementioned apps are the ones that we think are the best for rooted devices but we’d love to know your favorite root app. Do let us know about it in the comments section below.